We are transparent with our results. I monitored GreenGeeks uptime, response time and performance data with the help of your tools and get ready to read the best GreenGeeks review on the internet. Disclaimer: I need to tell you that I was affiliated with some products mentioned here and I will receive a commission whenever someone purchases a product. You won’t be charged any extra amount, in fact, you will receive an exclusive discount for using those links. The client panel is simple with all necessary details and the typical cPanel found with most companies. I kept monitoring the up time of my demo site http://hostingstep-gg.com for every 60 seconds through our monitoring tools. The best thing about GreenGeeks: Uptime. You can see the site scored 100% uptime for three months and 99.99% for remaining months which is quite impressive. There was some two hours downtime on May 18 during non-production hour. So the uptime is 99.97% for the month. the company also notifies you regarding the maintenance period through emails. So, I was really satisfied with the uptime, its perfect. Another good thing : Response time. It is nothing but the total time taken for the site to load from the different part of the world. While some hosting companies takes more than 1.500 seconds to loads, GreenGeek loads in milliseconds from 0.118ms. 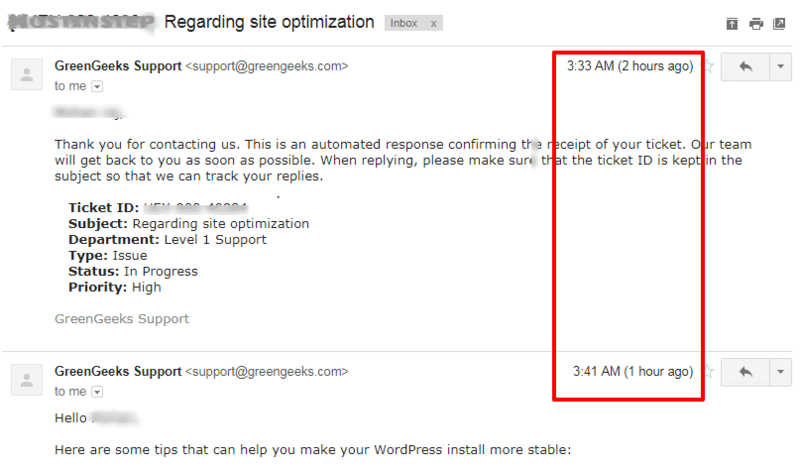 Remeber the response time is calculated without any caching plugin or any type of optimizations done before. I was impressed with the results and next month, I will do necessary optimizations and calculate the response time again. I hope the site loads even faster. The company promises no questions asked 30 days money back guarantee along with good performance, there is no better time to start your blog. ​If the performance of any hosting company is good, then you can understand they're serious with their business. Similarly, GreenGeeks with good performance has a very good customer support. Even at Midnight 3AM, they offer you Customer support via chat,ticket and phone. Though chat support is available, I created a ticket and to my surprise I got a reply in 8 minutes which is industry's average ticket response time. Every GreenGeeks account will have a positive energy footprint on the environment. We replace, with wind power credits, 3 times the amount of energy a website will use. We are also recognized as an EPA Green Power Partner too. To show my support, I'm moving few of my sites to GreenGeeks to support Green Energy. If you navigate to about us page on GreenGeeks, you can see the faces behind the company. Trey Gardner, CEO of the company worked in more than five hosting companies before founding GreenGeeks. A quick visit to his Linkedin page, I found he joined IPage hosting in March 2000 and while writing this review in July 2017, he has merely 18 years experience in the web hosting industry. GreenGeeks was founded in 2008 and till date, they managed to have 35000+ customers and 300,000+ websites deployed on their servers. I was extremely excited to see what's the best thing about GreenGeeks which was powered by 18 years of CEO's experience. As usual, I bought a hosting account like a normal customer, deployed a WordPress site and started monitoring the performance of their servers. Domain and Hosting registered in December 2016. GreenGeeks spent most of time in 2017 to completely revamping the shared hosting architecture for better performance, scalability and reliability. Hostingstep recommends GreenGeeks to its visitors. Since there is an 30 days money back guarantee providing you an zero risk factor, you can actually get an account, try it and I bet you won't get disappointed.